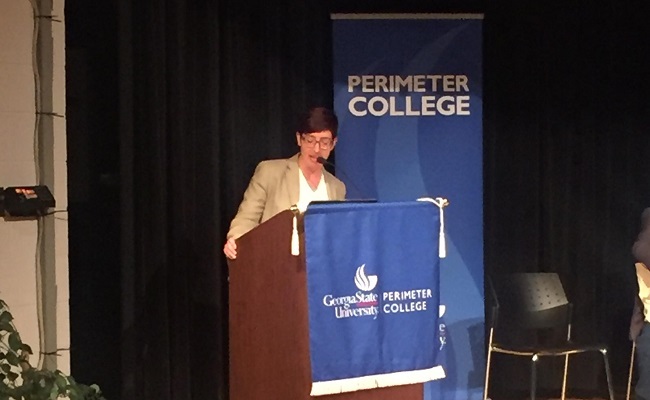 A couple of weeks ago, I got to spend some time in my old stomping ground of Atlanta, Georgia, when one of my best friends from graduate school, Jennifer Colatosti, invited me to speak at Georgia State Perimeter University. Jennifer, an Assistant Professor of English and assistant chair of the English department at the Decatur campus, organized two events that occurred between March 22 and March 24. On Marc 22, Jennifer organized the LIT lecture series sponsored by State Farm. In my talk, I shared interactive visualizations from my recent online book, #TheJayZMixtape to explain the overlaps between rap and traditional literature. The next two days, March 23 and 24, Jennifer was a co-organizer for the Lost Southern Literary Voices Festival. At this event of more than 30 accomplished literary scholars, I had the privilege to talk about southern literature alongside very accomplished scholars such as Professors Trudier Harris and Tony Grooms. During my visit, I had down time to catch up with Jennifer. We didn’t miss a beat from our grad school days. We started talking about various topics ranging from Ralph Ellison, Amiri Baraka, and we even talked about how our we have both used music in our class to get our students interested in literary art. I met Jennifer over eight years ago when we were both invited to visit the University of Kansas as prospective graduate students. Little did I know back then, but Jennifer would come to play a major role in my graduate education, particularly as an intellectual sparing buddy and someone I would often share ideas with about articles I was working on while in grad school and even my dissertation. At some point, during our conversations, both of us realized just how important Professor William J. Harris influenced our intellectual trajectory. We took two classes from him, one on Ralph Ellison and Amiri Baraka and another course on the Black Arts Movement Era. Our interactions with Professor Harris, at such an important time in our intellectual development, undoubtedly shaped our academic outlook and prepared us for the type of work we are doing today as professors. In every course we took with professor Harris, he emphasized the importance of integrating music into literary study. It’s been three years since we graduated from the University of Kansas and eight years since we first took our first class with Professor Harris. I suspect in the coming years, Professor Harris’s class will still be a major influence on our careers.